Bond fans and critics have heralded the release of new Bond movie Skyfall, as a great British bulldog of a film. It's fitting then that an iconic and original Royal Doulton bulldog takes on a starring role in the 23rd outing of this British movie blockbuster. Now Bond fans are in for a treat with the chance to get their hands on their very own reproduction. 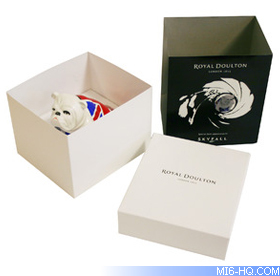 In honour of his special appearance in Skyfall, Royal Doulton has reproduced this charming British icon, sure to become a coveted collectors' item, just like the original. 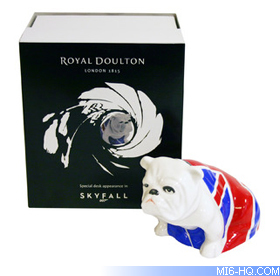 The new bulldog is named 'Jack' and has a special Skyfall backstamp which includes 'DD007' (where DD stands for Doulton Dog) and a Skyfall box sleeve. 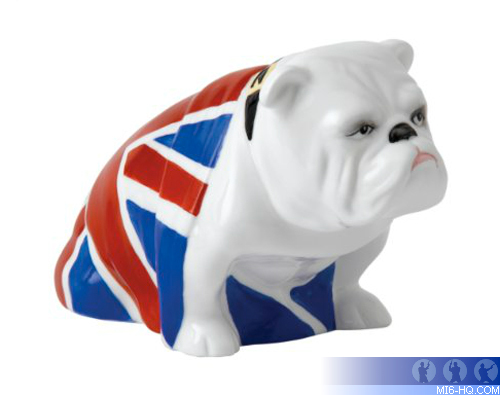 Named after the bold Union Jack flag that is emblazoned across his back, Jack is based on an iconic bulldog, originally modelled in 1941 by Royal Doulton's great art director Charles Noke. Since the 19th century the Bulldog has symbolised the steely determination of the British character and, given wartime Prime Minister Winston Churchill's uncanny facial resemblance to the dog with its many fleshy and drooping jowls, it was inevitable that the 1940s saw a plethora of bulldog-linked propaganda and imagery. Seventy years on, and in harmony with a momentous year for Great Britain, the Royal Doulton bulldog takes centre stage once again. Royal Doulton bulldog 'Jack' sits pride of place on M's desk in several of the film's MI6-based shots; he survives an explosion and plays a poignant role in the film's final scenes.